← So, what does a 1099a mean?! Spring has finally stumbled upon us, so has spring cleaning…well, okay, Im at least some what attempting to at least clean up the muddy foot prints from spring 😉 I prefer healthier cleaning solutions and since I cannot convince CJ that Vinegar is a totally viable option I use Shaklee…have you heard about it? Neither had I until a couple years ago when a friend (Becky thats you!) gave me a small sample of hers to try and uhm I am still using that same sample! I clean my house multiple times a day and knowing that what I am washing my floors with wont kill my kids is frickin awesome in my book! I also use the dish washing soap which I officially love…one small drop can get me through all of my pots and pans and that makes me 😀 especially because it doesn’t leave a lovely soapy taste after the fact!!! I know I am blabbing about how much I LOVE SHAKLEE but I really do. I find it effecient, non caustic and I can make it last forever so to me its frugal. I have the awesome privledge of knowing an awesome Shaklee Rep Jessica her website is http://www.healthyhappyliving.myshaklee.com Yea she is kinda like the bestest ever! So wunna try out this rockin give away? I will announce a winner in one week from today! So please play and win so you can enjoy this awesome cleaning product! I've tried a few of the Shaklee products and really like them. 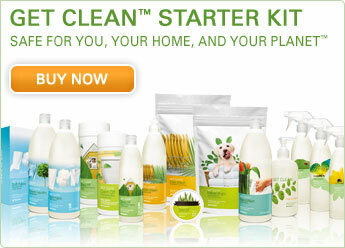 I'm always hunting for a good, safe cleaner – I'd love to give this a try. Thanks!